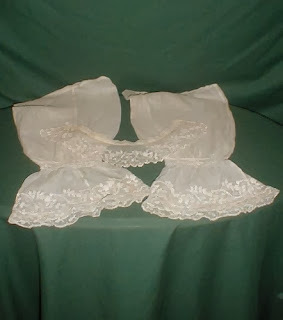 An exquisite set of 1860’s cotton under sleeves and matching collar. The sleeves and collar are both embroidered with white flowers and vines. 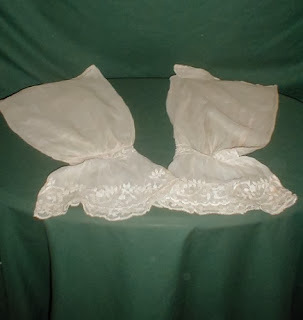 The under sleeves have a wide flounce style cuff. 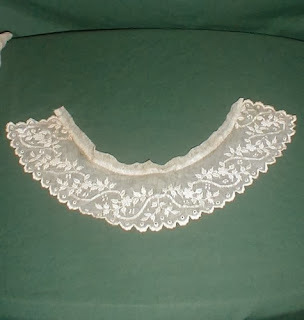 The collar is small and would fit the neckline of a dress. Both are in very good and study condition. There are no holes and just a couple of tiny age spots. Sleeve length 20 inches. The collar is 15 inches around the neckline. 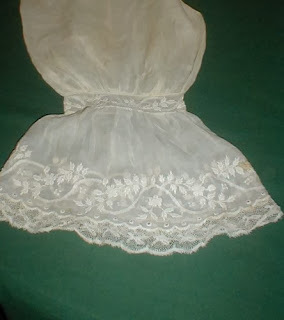 So you know that just less than a yard of lovely embroidered scalloped trim that is always left over after sewing a petticoat? Here's what to do with it.